"6 ft 6, Hazel green/blue eyes. If I could showcase my love for animals, along with my dad quality puns, then my purpose in life will be fulfilled... I'm sure some people will find me EMU-zing. I've been in Cycling teams in Belgium, whilst also having gone to Worlds, in Las Vegas, for Trampoline Dodgeball with Skyzone as the Australian Team Captain." Duncan is a great friend of mine who loves his shrimps, his dog, his chickens, my cat and Angel. With his punny nature, caring personality and deep seducing voice he will be an awesome vet on the show! Duncs is my classmate, bestfriend and partner. He is undoubtedly the most loving person. The way he cares for all his animals has left me speechless. The video actually shows the daily duncan-wherever he is, there are laughters. Duncan is extremely funny and always bursting with energy. He is also the most caring person I know. His personality is sure to shine through on television, and I look forward to seeing a Bondi Vet that we can all get behind and is himself learning along the way. Duncan has been looking after my 10 year "old chook" charcoal the Australorp while we move. He's managed the pecking order with his own chickens masterfully and we can't thank him enough. He brings a special charm and kindness to animals. 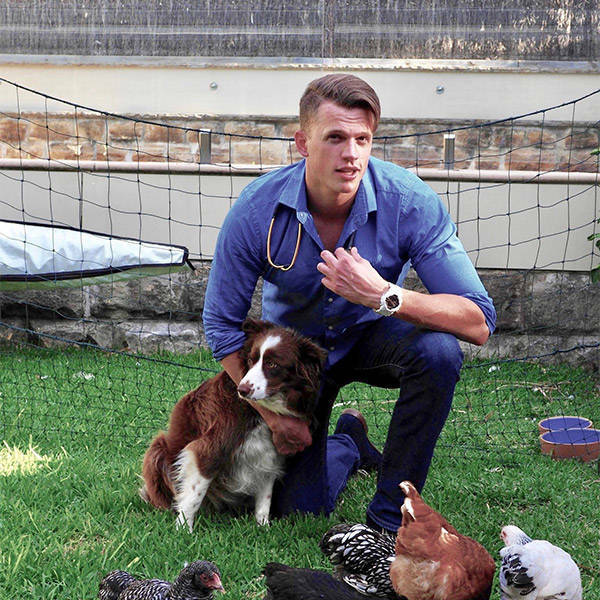 Duncan would be a fantastic Bondi Vet! Duncan worked with Mad Paws while he was studying Vet Science at University of Sydney. He was absolutely fantastic in helping customers with any pet problems. He is also one of Australia's biggest animal lovers! Can't wait to see him become an awesome vet! I've known Duncan for many years. He is a man of many talents. Really intelligent, charismatic, funny and always bursting with energy. He would be a great personality to have on TV and especially to show case his love of animals.